The FastMount™ PRO is the ultimate 3-in-1 smartphone accessory! 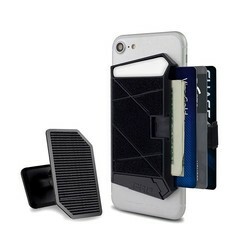 The FastMount™ PRO is a phone wallet, a dash mount and a phone viewing stand all in one! Using our Lockhide™ technology, the FastMount™ PRO can mount to your dash for hands-free access in your car. It also has an integrated card and cash storage slot and a kick stand all rolled into one great and useful accessory for your phone.